at either 10:30 or 1:30 on Saturday, September 1st. "A new generation of preschool “neighbors” will get to experience the Neighborhood of Make-Believe when DANIEL TIGER'S NEIGHBORHOOD premieres Monday, September 3, 2012, on PBS KIDS. The first TV series inspired by the iconic, award-winning MISTER ROGERS' NEIGHBORHOOD, DANIEL TIGER'S NEIGHBORHOOD from The Fred Rogers Company stars 4-year-old Daniel Tiger, son of the original program’s Daniel Striped Tiger, who invites young viewers into his world, giving them a kid’s-eye view of his life. As they closely follow and share Daniel’s everyday adventures, preschoolers ages 2-4 and their families learn fun and practical strategies and skills necessary for growing and learning." We are huge PBS SoCal fans at our house. like I did growing up with Mr. Rogers. that allows them to be little and not grow up too fast. 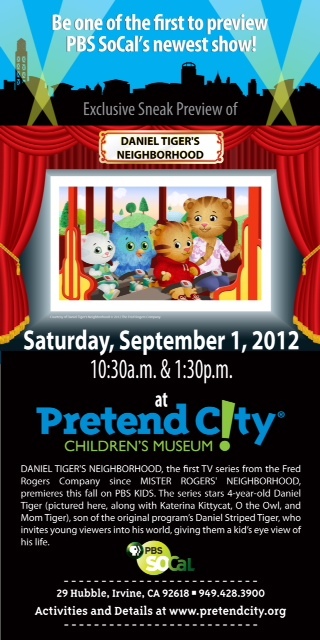 and catch a preview of Daniel Tiger's Neighborhood! You can read more about Daniel HERE!